One of the things I was looking forward to experiencing here was all the tropical fruit and in the month we’ve been here the island has definitely not disappointed. Last week we went to Rincon to check out the family property and spend some time researching the temperature of the water on various beaches…you know, for science. Rincon is basically out in the countryside of Puerto Rico. It has no traffic lights, a small plaza, tons of beaches, and high mountain vistas. During the summer Rincon is a sleepy beach town with locals paddle boarding and camping along the beaches. The surf picks up in the winter and with the surf comes snowbirds and surfing tourists from the states. 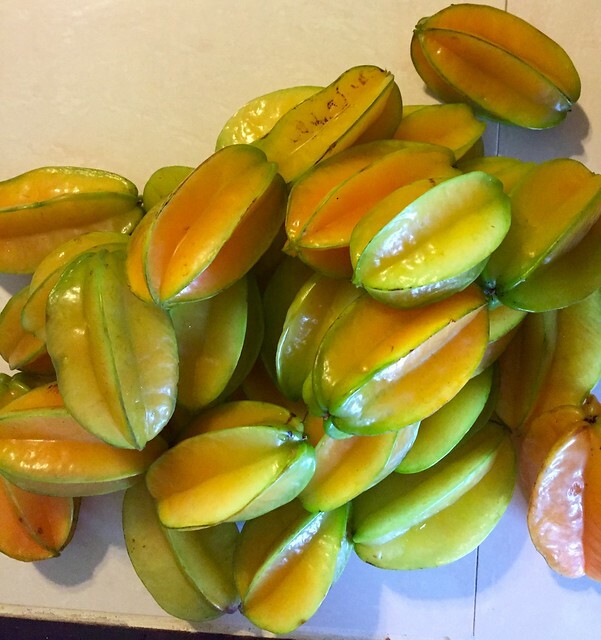 This past week was great for experiencing summer fruits in Rincon. Driving into Rincon from the south on Hwy 115, you’ll enter a canopy of trees in the neighborhood of Calvache. This tunnel is called “Mango Alley” because you’re literally driving in a tunnel of mango trees. Mangos are ripe late July through August and locals just stop on the side of the road and pick up the mangos as they fall to the ground. It’s not just here, you can find people pulled over on the side of most roads with their bags picking them up. 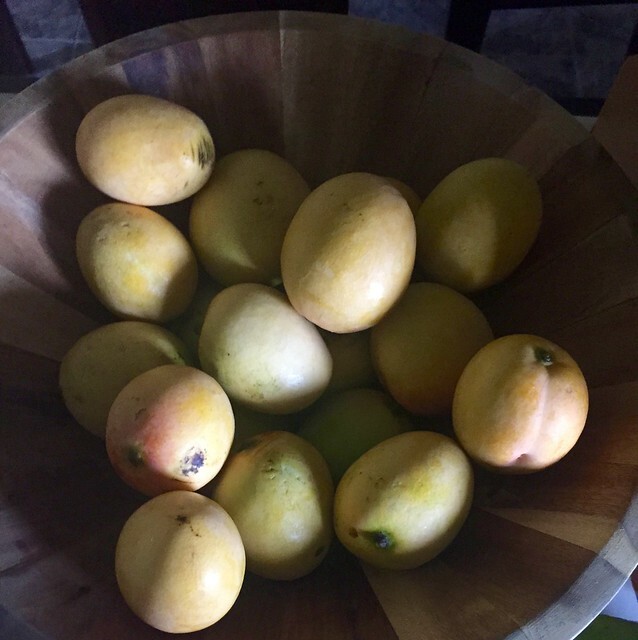 Note to future summer travelers, don’t pay for mangos in Puerto Rico, as long as the trees aren’t in someone’s yard, you’re free to take the fruit that falls on the side of the road. Also, be careful, mangos don’t discriminate, they are liable to give you a concussion or dent your car if you aren’t looking. Alejandro got grazed when we were at the beach one evening. 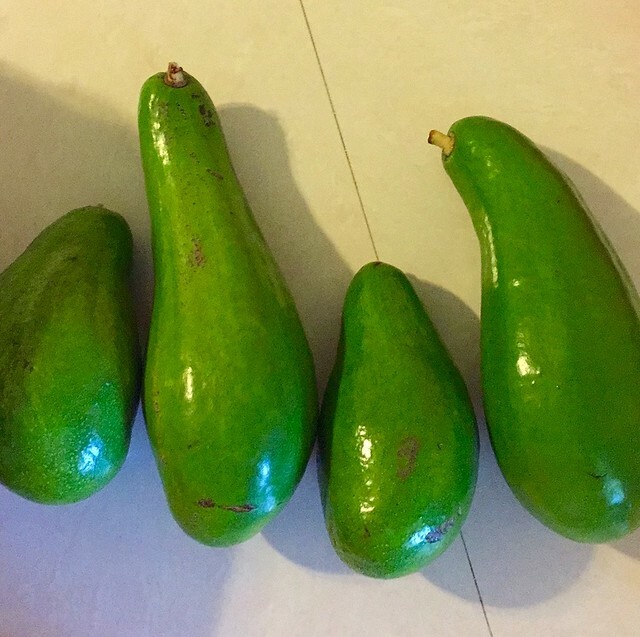 It’s rare to not find a backyard full of a variety of fruit trees here - bananas (guineos), plantains (platano), star fruit (carambola), guava (guayaba), avocados (aguacates), breadfruit (pana), coconut (coco), oranges (chinas) - some I’m familiar with, some not so much but it’s wonderful to get to try them all. 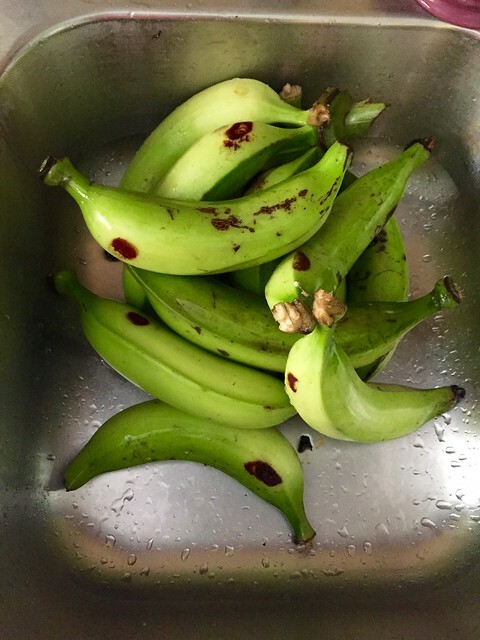 I can’t stress enough how abundant the bananas are here, and not just the large Chiquitas we get in the states at the store, but bananas the size of your hand, bananas the size of your finger, and they are all used in a variety of different ways. Alejandro’s mom cooked a lovely meal of bolitas de guineos verdes con gandules. Almost like banana dumplings in a stew. 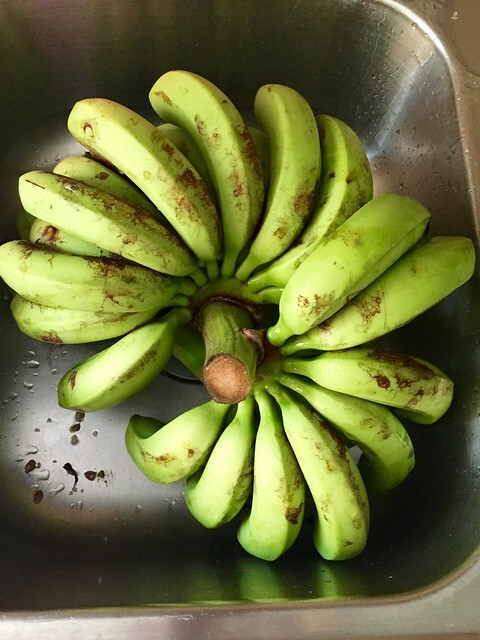 The green bananas aren’t sweet and add a tasty starchy quality to the food you cook them in. 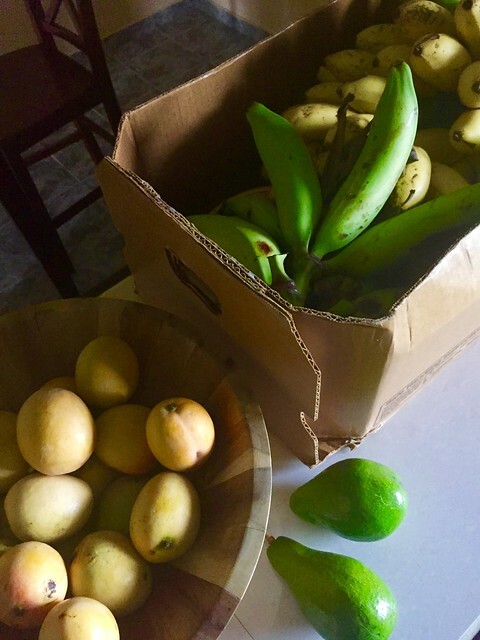 We collected a lot of fruit from the family farm while we were in Rincon. 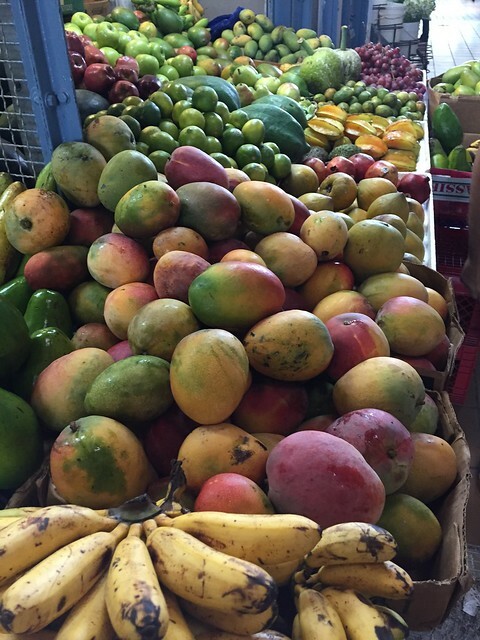 We came back with boxes of mangos, star fruit, plantains, bananas, and avocados. 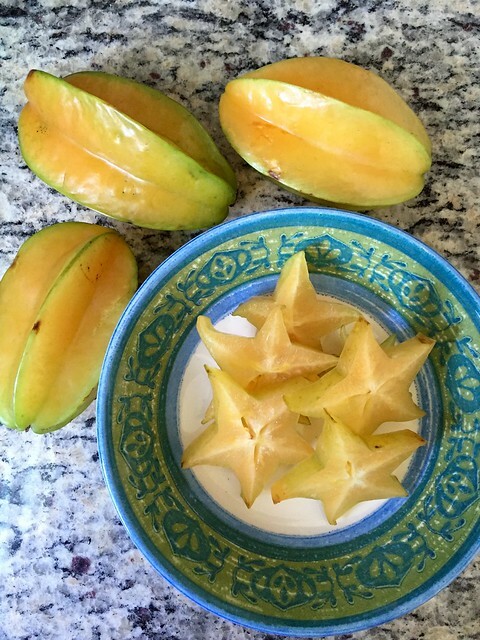 Since here, I’ve learned I really enjoy star fruit. While I’ve had it before its not all that common in the states and if you eat it green you’re likely to end up with a puckered look on your face. If you like sour, eat them green, but I think they are best when they’ve turned their lovely shade of light orange. They taste like a light mild version of an apple peach cross…sort of…just try one. 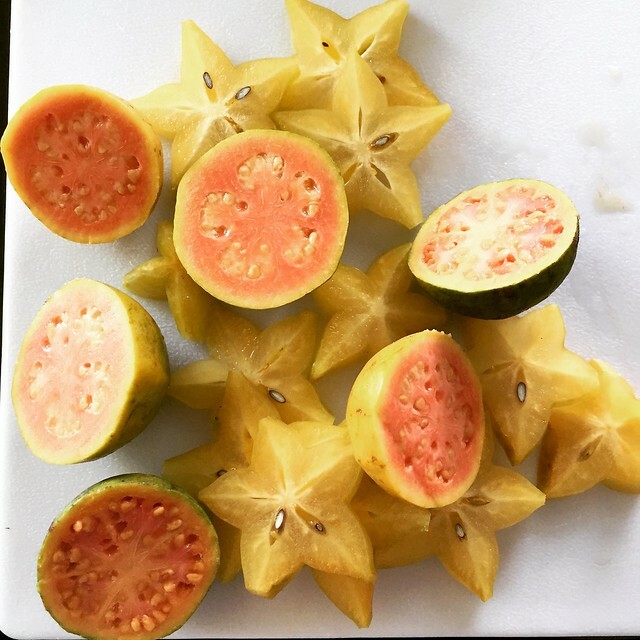 Just slice them so the pieces form a star and pull the few little seeds out. We had so many I even juiced a few in the food processor then strained out the juice. They make for a very refreshing drink. 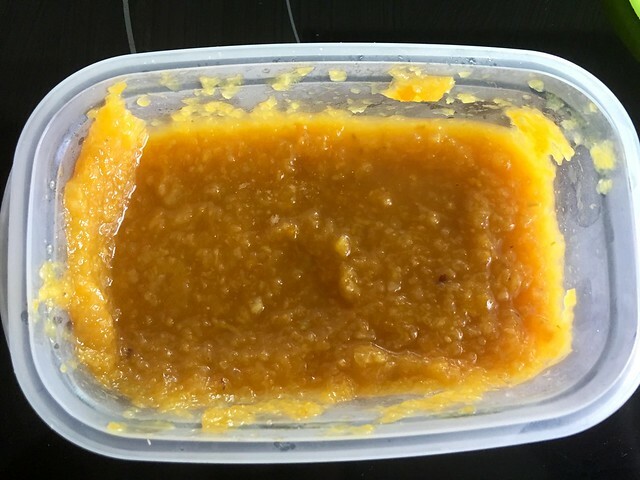 Not wanting to waste any of the fruit I used the pulp with the flesh of a mango and made a jam with a little lime juice and sugar. It really is a great treat and its even better knowing where all the fruit came from. I can’t say enough about the fruits here, they are truly fantastic. 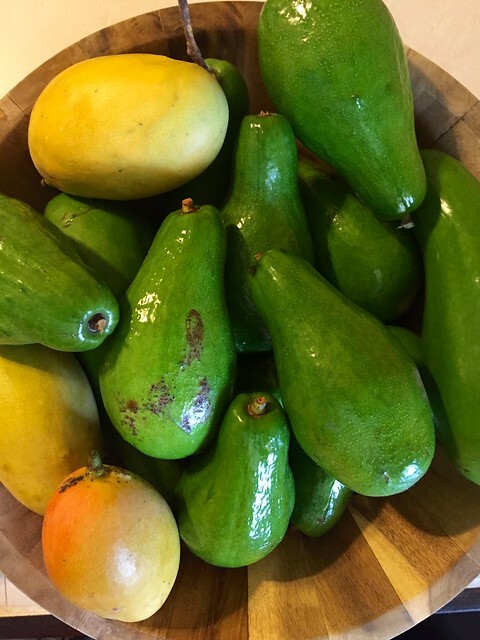 While I can’t say a vegetarian would call this a food paradise, at least you’ll have plenty of fruits to enjoy all over the island when you’re searching for some meatless cuisine!